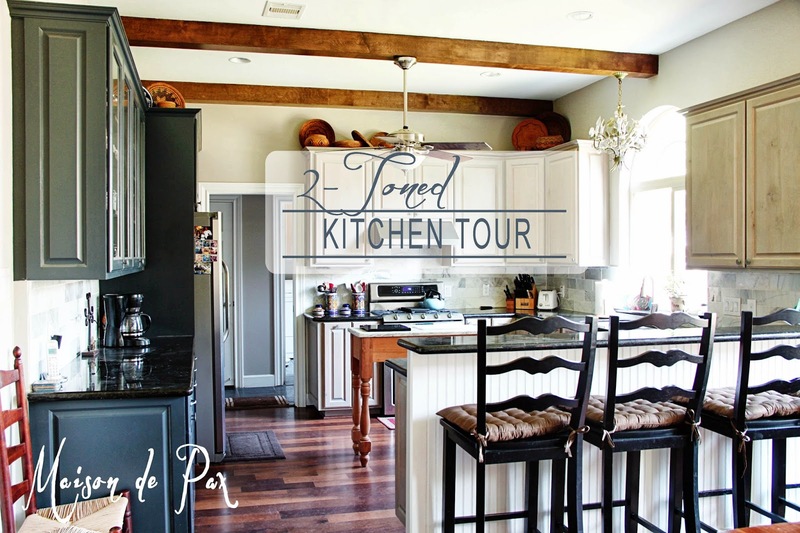 Today I have a beautiful kitchen to share with you. I cannot take all much of the credit for this one; my mother spent hours and hours planning and designing this kitchen with both functionality and beauty in mind. I think her hard work paid off! I had the privilege of attending Blog Elevated weekend before last, and I’m still processing everything that was shared… So fabulous to have the opportunity to connect with other bloggers, though, and to learn! In the meantime, I’ve been under the weather, and I’m leaving on Thursday for a weekend trip… When it rains it pours! All that to say, today seemed a perfect day to share a little tour of my parents’ new beautiful kitchen. I’ve been helping my parents decorate their new home (with gallery walls and more), but though I gave advice when asked, my mother really designed the entire kitchen. And I think she did an amazing job. Her accent wall is a lovely deep navy blue (deeper than the picture shows, really). And their tall ceilings allow them space to show off their eclectic collection of American Indian baskets and Mexican pottery. 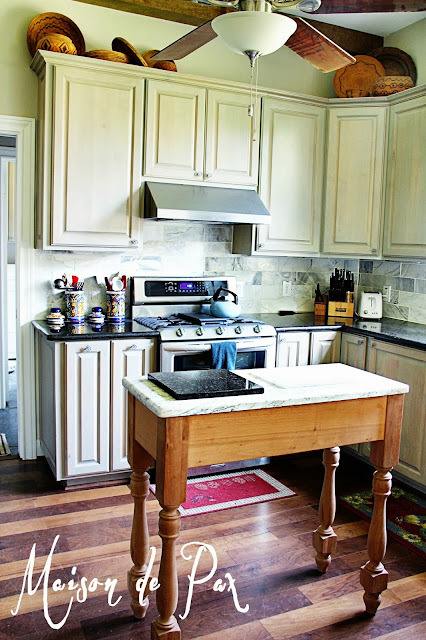 She used the marble top from an old dresser and had a base made to fit it for an island. She originally was planning to paint it, but she (and I agree!) is really loving the natural wood for now. The carrara marble island complements their marble backsplash beautifully, and the granite on the main countertops allows for beauty and low-maintenance upkeep. We also can’t ignore their stunning walnut floors – I love how they are truly brown (not red or yellow), but they’re not terribly dark; the variations are lovely and balance the rustic ceiling beams perfectly. The light in the room (though very challenging for photographing!) is delightful (pun totally intended). 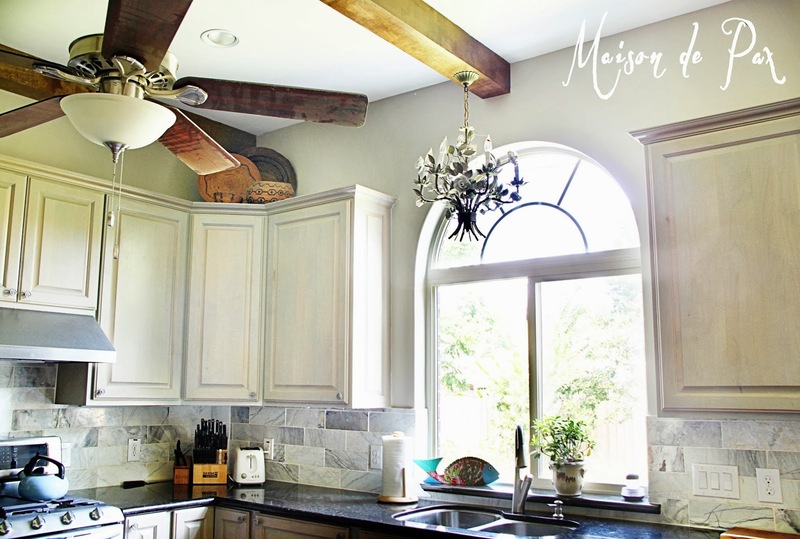 The extra-large window above the sink keeps the room bright and cheery. And the chandelier above the sink hung in my grandmother’s breakfast room in my father’s childhood home. 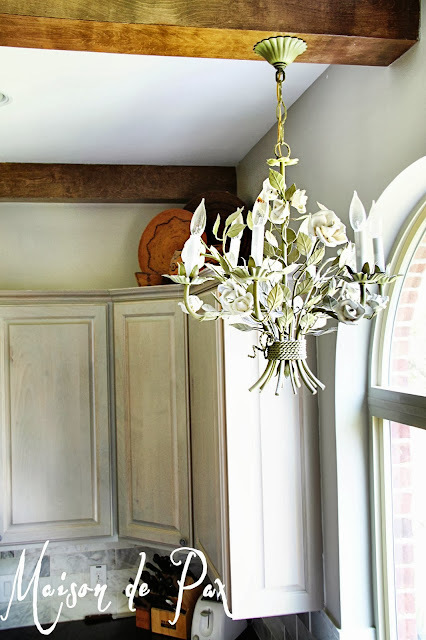 Since she passed away a few years ago and the home had to be sold, I love the addition of the fixture here. Is that a beautiful kitchen or what!?!? I could go on and on, but I leave you with this thought: I often find beauty in juxtaposition of contrasting items. 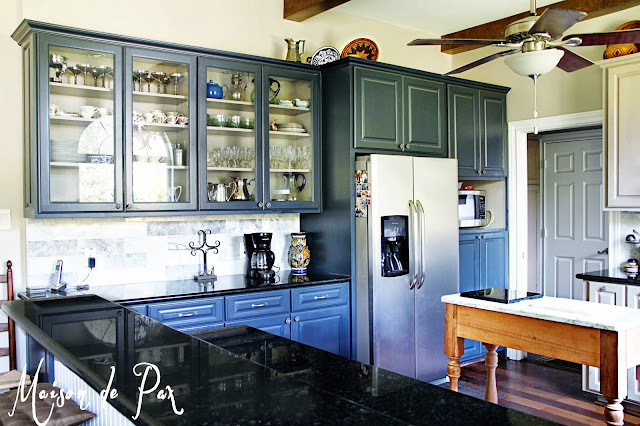 How many lovely contrasts can you find in this kitchen?